After visiting twice in one summer, Banff National Park became one of our favorite spots in Canada. Although both road trips were too short, one was three nights and the other was two, we were still able to cover quite a bit of ground. One of our favorite pastimes quickly became gazing at the bright blue lakes with rocky mountains in the background. There are so many spectacular lakes throughout the park, and depending on the light, the range of blue hues varied along a spectrum that we never knew was possible. From bright aqua to a milky blue, we witnessed shade after shade. In addition to staring at the lakes with our jaws flapping in the wind, we canoed on Moraine Lake twice, camped in two different campgrounds, hiked the Johnston Canyon Trail and the Sulphur Mountain Trail, rode the Banff Gondola, soaked in the warm waters of the Banff Upper Hot Springs, explored the Cave and Basin National Historic Site, and wandered around the adorable downtown area of Banff. Banff National Park was Canada’s first national park, and it is situated within the Canadian Rockies mountain range. 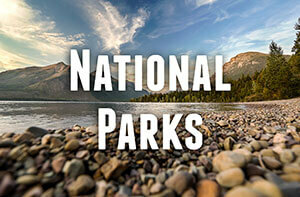 The park encompasses more than 2,300 square miles of mountains and wilderness. While we still have so much of the park left to see, we have already fallen in love with this slice of mountain paradise. Here’s a peek into our two adventures through the park—hopefully we can add visit number three to the list soon! Lake Louise is located a short drive from the Village of Lake Louise. Just like many of the lakes throughout the park, the glacial lake is a bright turquoise and surrounded by snow capped mountains. There are several hiking trails, canoes are available for rent, and a beautiful castle-like hotel, the Fairmont Chateau Lake Louise, overlooks the lake. When driving along the Icefields Parkway, we had to make a stop at Bow Summit for views of Peyto Lake. A short walk from the parking lot led us to these views of the milky blue lake in the valley below. Located just a short drive from Peyto Lake, we found Bow Lake and couldn’t resist stopping there, as well. Bow Lake is located right next to the Icefields Parkway and it is easily accessible from the parking lot. We relaxed on the rocky shoreline and snapped way too many photos before continuing on our way. Moraine Lake ended up being one of our favorite spots in the park. The lake is located less than 10 miles down the road from Lake Louise, but the road to the lake is closed during the winter months (usually mid-October to mid-May). There are hiking trails, a lodge and canoe rentals at the lake, and if you are visiting during peak summer times, make sure to arrive early because it gets busy, especially if you want to rent a canoe. We loved this lake so much that we couldn’t resist renting canoes both times we visited. The water was bright turquoise and crystal clear–it felt as though we were gliding through the air! Even though our visits were only a month and a half apart, it was interesting to see how different the atmosphere felt. Our first visit in mid-July felt like summer, and our second visit at the end of August felt much more like winter; however, both were equally as beautiful! The Johnston Canyon Trail consists of a catwalk that is suspended over a river deep inside the canyon. The hike is fairly easy and the trail to Upper Johnston Falls is 3 miles roundtrip. Along the trail you will find several cascading waterfalls and fantastic canyon views! Another adventure that we really enjoyed was hiking up Sulphur Mountain and then taking the Banff Gondola back down the mountain. The hike is 3.4 miles each way and the elevation gain is 2.300 feet–it was a steep hike but very rewarding. The views from the top look over the town of Banff, and if you don’t feel like hiking, you can take the gondola both ways. The town of Banff is adorable and filled with restaurants, bars, shops, a river to canoe on, and plenty of other activities. We couldn’t resist spending an afternoon browsing the shops and relaxing at coffee shops before heading out to dinner–dining out was a welcome break from campfire food! Banff National Park has several hot springs and you can learn more about the hot springs at the Cave and Basin National Historic Site. The site is more of a museum and you cannot actually go for a swim in the springs. Honestly, this wasn’t our favorite spot, but since admission is only a few dollars, it was an interesting way to learn about the park and the hot springs within its boundaries. In our opinion, the Upper Banff Hot Springs was a better way to experience the hot springs in Banff. Soak in the outdoor pool and gaze at the mountains in the distance–it is the perfect way to spend a few hours of your day. Plus, if you are camping, it’s a great way to take a shower…in the showers prior to entering the hot spring, of course! Throughout both of our visits, we spent several nights camping at the Tunnel Mountain Village I Campsite and one night camping at the Lake Louise Campground. We enjoyed both campgrounds and we lucked out with nice weather every night except for the morning when we woke up with ice on our tent! Vermilion Lakes is a series of lakes near the town of Banff. We enjoyed checking out the views from several of the lakes, and while we didn’t end up hiking in this area, there are several hiking trails if you do want to explore more. Lake Minnewanka is located in the eastern portion of the park, an area we didn’t get to explore much. We drove around the area one afternoon but ended up getting stuck in a thunderstorm. The only sight we had time to see was Lake Minnewanka, but it was worth it for the views! We always seemed to be busy around sunset, so one of the only sunsets we managed to catch was through the car window. We loved how late the sun set in July–it didn’t get dark until after 10 p.m., which gave us plenty of daylight to explore! Even with the late sunsets, we managed to stay up late a few nights to capture some star photos. The first shot we captured was from a lookout point just across the road from the Tunnel Mountain Campground in Banff. This was the night at the Lake Louise Campground where temperatures were below freezing, but at least we lucked out with clear views of the sky! We couldn’t get enough of Moraine Lake in the daylight, so we had to make an evening trip to take some night photos, as well. Even though the lights from the lodge were bright, we still managed to capture some stars! While we love so many spots throughout Canada, Banff National Park is definitely one of our favorites. The endless lakes, mountainous landscapes, and opportunities for adventure make this a standout destination! Have you ever been to Banff National Park? I have been and fell as much for Banff National Park as you. 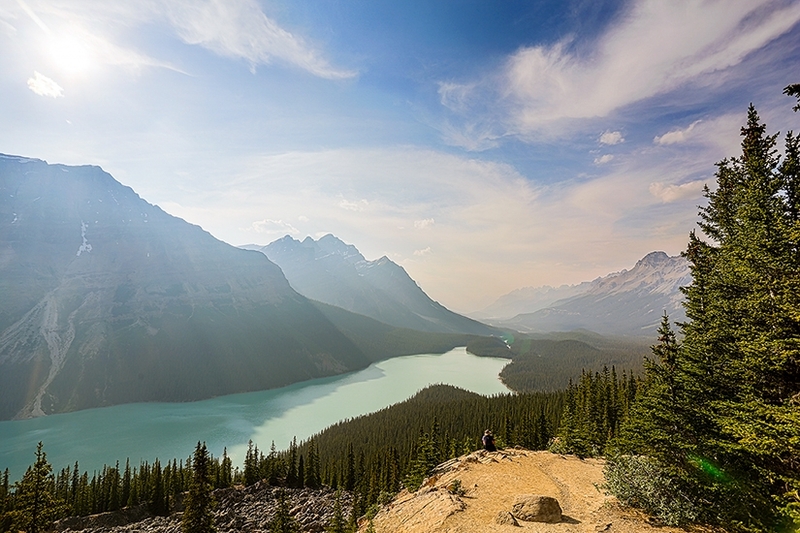 Peyto lake and Lake Louise are absolutely gorgeous and your pictures are fabulous once more. It’s great that you could go back and enjoy it all twice this year! The photo essay is as beautiful as usual, thanks for the ride again! Thanks so much! 🙂 So glad you loved it there too–such a gorgeous spot, isn’t it?! I rode the parkway on a bike once. It’s an all time favorite tour. Next time try the Wilcox Pass Trail by the icefield. It’s a 2hr scuffle up to a good overlook of the glaciers coming out. Very cool–would be fun to do some biking there! We definitely want to make it to the ice fields next time. Thanks for the suggestion–we will have to add that trail to our list! We haven’t been to Canada yet, but every time I see photos of it, I can feel the pull to go and see it for myself!! Your Banff National Park are incredible and definitely inspiration to pop it on the list!! Jolene Ejmont recently posted…Top 3 Things to See & Do in Shibuya | Tokyo’s Busiest District! Thanks! You will definitely have to make a trip to Canada sometime–so many amazing spots to see! Banff National Park is on my list, so awesome to hear it quickly became one of your favorite spots! I love that it’s not only incredible scenery, but you can actually take part in active adventure while enjoying the landscapes 🙂 Thanks for the inspiration to get there! Thanks, Meg! Definitely agree–being able to have adventures in the incredible landscapes makes it a great spot to explore! Oh my gosh! Wish i could go there now. Banff is high up on my list and your awesome photos made me more excited to see it in person. I have never been to this park but really want to go after seeing these photos. And I. 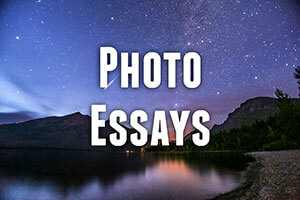 An understand why it’s a photo essay because words really aren’t necessary. So gorgeous and makes me want to visit some of the natioanl parks that Cananda has to offer. Thank you!! Thanks, Kelly! Canada definitely has so many amazing national parks and Banff is one of our favorites–hope you can check it out sometime! Oh wow these are some stellar shots of Banff. Btw you mentioned you spent 3+2 = 5 days in total there. Do you think it is not enough? What should be the ideal duration of stay? Thanks! I think you could cover a lot of ground in 5 days and it would be a great amount of time for a visit depending on what you want to see. I think if we would have had 5 full days in a row it would have been better, but splitting it into two trips made it feel like so much less time. Depending on your interests a few days to a week is a great amount of time to spend in Banff, but honestly, we could probably spend a month there, lol! These pictures are so stunning! I am suddenly overcome by an urge to travel to Banff. We had an itinerary of two weeks for Canada-Alaska in mind and I’m reminded of that now. Thanks so much! We’ve thought about a Canada-Alaska road trip too–so many great spots to explore! Banff has been high on my list since oh forever! Your photos make it look like such a wonderful place to have an adventure. One day I’ll get here and try to replicate the amazing time you had. Thanks–it’s a fantastic spot! Hope you can visit soon! As a Canadian I am absolutely embarrassed to say that I have not yet visited Baniff. I have been reading so much about it lately. Your pictures are absolutely beautiful and you are doing Canada pround. I love Canada!!! We love Canada, too–such a great country! 🙂 Isn’t it funny how the spots in our own backyard can take longer to explore sometimes?! Hope you can make it there soon! I’ve always wanted to go to Banff. In fact, I thought we were going to make it this year, but instead we are headed to Eastern Canada. Your pictures are stunning, and it is views like that, that make me want to go and see it for myself. My grandmother used to travel there and send me postcards when I was a child. Seriously, I’ve been in love with Banff ever since!